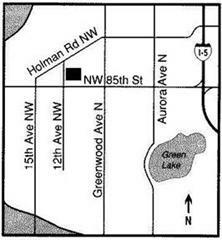 Crown Hill Cemetery is conveniently located within Seattle’s city limits, between Holman Road NW on the north and NW 85th Street on the south. Our office entrance is located at 8712 12th Ave NW. Take exit 172, the 85th street exit. Go west on 85th St. 1.5 miles. Turn right at 12th Ave NW and proceed north 1 block. Drive north on 15th Ave NW. Turn right on NW 85th street. Turn left at 12th Ave NW and proceed north 1 block.